Olon Beach is just 2 minutes from Montañita (taxi $1,50), well outside of the tumultuous party-scene but still close-by. Olon offers one of the nicest and longest beaches in Ecuador, Green Hills, Great Restaurants & more. CLP Bus Company will take you from Guayaquil Airport (Terminal Terreste) directly to Olon, in about 3 hours. Buses leave 10 times a day from 4.30 am to 6.30 pm, with a fare of $6,- (2018). Alternatively, you can take any of several buses (CICA, CLP and more) that go to Santa Elena, La Libertad or Salinas, and continue from there. 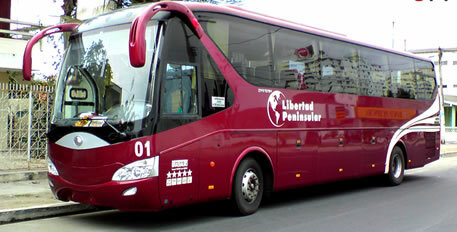 Manglaralto Bus Company goes directly from Manta to Olon. Buses leave from the Terminal Terreste in the center of Manta directly to Olon from 4 am until about 4 pm. There is 1 later bus too, but don't count too much on that one! The cost of the trip is $6,- from Manta and it takes about 3,5 hours From Puerto Lopez it's $2,50 and about 1 hour. - Take the Second Small Street to the Right. You should now see our building: You've arrived at Rincón d'Olón! Have a lot of Bags? Let us know your time of your arrival, and we'll wait for you at the CLP Bus Terminal in Olon! Take a CITUP or MANGLARALTO bus from the Sumpa Bus Terminal in Santa Elena directly to Olon. Buses leave from Santa Elena to Olon from 4 in the morning until about 9.30 pm. The cost is $1,80 and the trip takes about 1h15min. If you want to travel directly from Quito or Baños or even from Peru (Punta Sal/Macora) to Olon or Montañita, there are direct buses that go without stopping, throughout the night. Their price is a bit higher as taking local buses, and people have been stolen from on these trips, keep your eyes open and belongings close! Please contact us if you would like to book you a ticket: We will refer you to specific Travel and Tour agencies in Quito and Baños that can sell you one directly. CIFA International does the route from Peru!